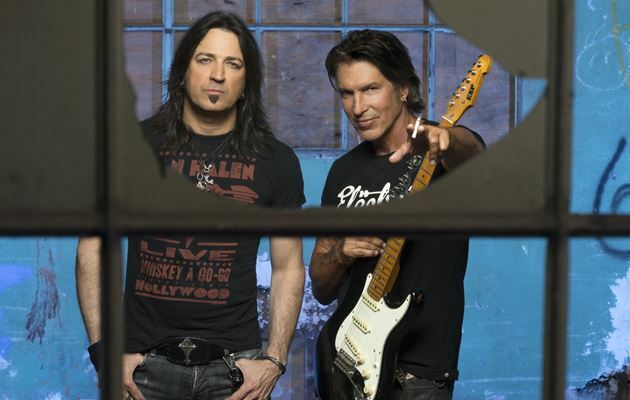 The official lyric video for the song "September" from SWEET/LYNCH — the new band featuring guitarist/vocalist Michael Sweet of Christian hard rockers STRYPER, legendary guitarist George Lynch (T&N, DOKKEN, LYNCH MOB), bassist James Lomenzo (MEGADETH, WHITE LION, BLACK LABEL SOCIETY) and drummer Brian Tichy (S.U.N., WHITESNAKE) — can be seen below. The track, a tribute to the victims of the 2001 attacks on the World Trade Center in New York, will be included on SWEET/LYNCH's debut album, which will be released in early 2015 via Frontiers. Sweet told Guitar International about SWEET/LYNCH: "It was the brainchild of Serafino Perugino at Frontiers Records. He asked me to basically sing on this record and then I suggested producing it. I co-wrote the songs with George. I called Brian Tichy and James Lomenzo to put the band together. It's an incredible combination of classic '70s and '80s. You will hear some flavors of JOURNEY, BAD COMPANY, DOKKEN, VAN HALEN and STRYPER." He added: "I love this CD. I'm super excited for people to hear this CD. I'm so proud of it. "James and Brian are amazing musicians. They tore it up. The drums and bass are just as impressive as the guitars. Everybody really delivered… The musicianship level on this is top notch. It sounds as if we were all in the stuff playing together and we were not. Basically, George wrote some riffs about a minute to a minute and a half long. I wrote lyrics and melodies then arranged them. I cut and pasted them together in the studio. Then Brian and James came out and tracked the drums and bass, as well as some rhythm stuff. We then sent it to George to add the guitars." SWEET/LYNCH recently finished filming two videos and an EPK (Electronic Press Kit).